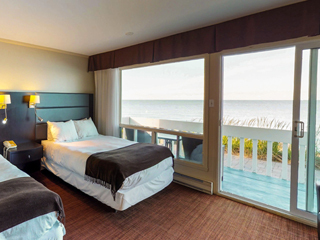 Riôtel has three hotels located in the Gaspésie region of Quebec, Canada: in Matane, Percé and Bonaventure. These hotels are perfect places to stay for those who want to tour the Gaspésie region. Thanks to the hotel’s services, you can discover all the region’s treasures. Admire the sun setting from the comfort of the spa at Riôtel Matane. Savour fresh lobster against the backdrop of one of the world’s most beautiful bays at Riôtel Bonaventure. Or take in the unrestricted view of Percé Rock or Bonaventure Island from Riôtel Percé. With a little luck, you may even catch sight of marine mammals. At the heart of this maritime atmosphere, a devoted and attentive staff will attend to your needs and share their passion for this part of the world with you.